In 1982 I entered an outdoor sculpture competition in Minneapolis called "Out Door Art 82". This was a project started by Jack Becker at Forecast Public Artspace, a non-profit public arts organization. I was one of six artists awarded a grant to build temporary artworks in the metropolitan area. It was a fun summer, beginning with a park approval meeting and then cutting birch trees in Northern Minnesota. "The Acropolis for Minneapolis" was meant to be a bridge, if you will, between mankind and nature. This sculpture was inspired by a forest of only birch near my cabin in Northern Minnesota. I wanted to feel good about our human accomplishments so I mixed that idea with some art history. 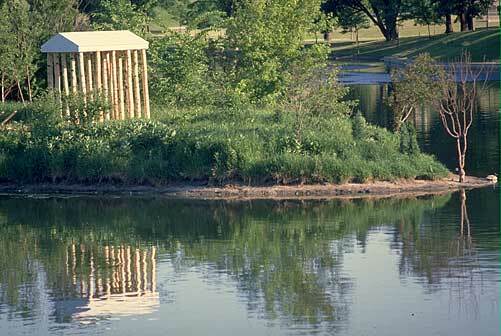 I built the sculpture on an island in a tiny lake surrounded by an urban park in South Minneapolis. After materials were purchased, my grant money was spent on a barbecue for all my friends and the other artists that helped me. It was fun to row my tiny boat out to the island where I built the sculpture. It was exciting to be on the island when they blew off the fireworks for the Fourth of July. One kid stopped his bike and asked me if I was building a log cabin out there.